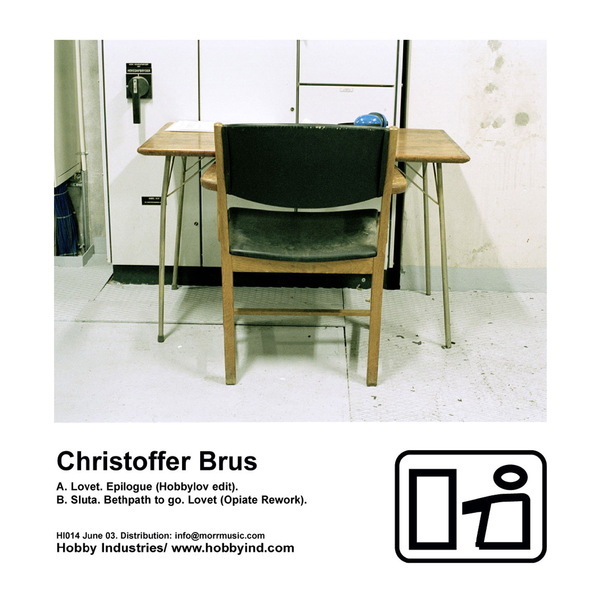 Another lush release on Opiate’s ever-marvellous Hobby Industries imprint, this time coming to us from Gothenburg’s Christoffer Brus. Functioning as part of a bustling, energetic clique of producers, mixing their musical skills with pure studio technique, Christoffer featured on the recent Spinform release and seems to be another new discovery for a label that has consistently delivered some sublime, unmatachable melodic and minimal electronica over the last few years. The focus here is the production of slow and melodic music , sounding never too far away from well disciplined children, playing naive electronica on arrays of toy-instruments, recorded in old analogue studios. These productions are all new, as is the Opiate Rework of "Lovet". Where most electronica is about focusing on letting the machines and plug-ins create the magic, Christoffer succeeds in creating a fine balanced organic and warm sound all his own. Lovely.